Apple crisp is such a comfort food, just like an old friend. So I asked one of my long-time, best, prairie friends, Faye, if she had a good apple crisp recipe. Of course, she did. The apples are tender, the topping is crispy and so yummy. I made some yesterday and will make some more today to freeze. Enjoy! - Mix together topping ingredients and place in refrigerator. The colder the better, as this will give you a crispier topping! - Peel, core and slice apples. Toss and coat with lemon juice and sugar. 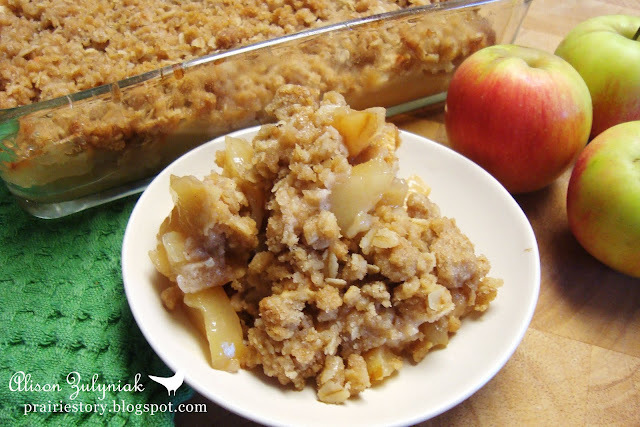 - Place apple mixture in a greased 9x9 baking dish. - Spread topping over apples. - Bake @ 375° for 35-45 minutes. Let cool for 10 minutes before serving. - Serve with ice cream, or as Faye highly recommends cold for breakfast! Oh my goodness. All these wonderful apple recipes are making me drool!! The apples her in FL are horrible. I miss our northern ones. Apple season has just begun in MN. eight glorious weeks of walking the orchards and getting the crispiest just-picked apples. Cannot wait to use this recipe. Love a good apple crisp! I can't wait till it starts cooling down a bit and I will be all over this, preferably with a scoop of homemade vanilla ice cream! I love apple season. Like you, I make apple sauce, crisp, pie, muffins - you name it. Your crisp looks delicious! Great recipe! Apple season is just right around the corner here! My family eats so many apples, I have to save some to make some crisp, Thanks for sharing! Have not made these before. Thanks for the recipe! Fabulous recipe! You are right, apple crisp is so comforting. I would love this as it is or with ice cream! In England we would call this 'Apple Crumble'. We usually eat it in the winter when it's cold with either hot vanilla custard or icecream. One of my favourites is Cherry crumble, another is Pear and Chocolate chip crumble. I will start making these around October time when the cold weather kicks in over here.. Enjoy yours ! Pear and chocolate chip crumble!!! Oh my I have never heard of that... I'll have to give it a try! I wish I had a big warm bowl of this right now! A big warm bowl of that perfect crisp with a scoop of ice cream. Yum! I adore apple crisp! I can't wait to try this recipe. Thanks for sharing! I love apple crisp but haven't made it for ages - thanks for reminding me of it and sharing such a yummy recipe. I just love apple crisp. It smells so good baking and tastes even better. And I would totally eat it for breakfast! What a yummy recipe! And so perfect since it's about to be fall weather!